"I got this recipe at a church potluck. All the flavors blend really well. I've made it for breakfast, lunch, and dinner. So far every time I've served it, I haven't had any leftovers. Enjoy!" Line the bottom of the prepared baking dish with biscuits. Heat a large skillet over medium-high heat. Cook and stir sausage in the hot skillet until browned and crumbly, 5 to 7 minutes; drain and discard grease. Scatter sausage over biscuit layer and top with 1 cup Cheddar cheese. Whisk eggs, milk, salt, and pepper together in a bowl and pour over cheese layer. Mix water and gravy mix together in a saucepan; bring to a boil. Reduce heat and simmer until gravy is thickened, 1 to 2 minutes, adding more water for a thinner gravy. Pour gravy over egg layer. Sprinkle remaining 1/2 cup Cheddar cheese over casserole. Bake in the preheated oven until egg is fluffy and cheese is bubbling, about 30 minutes. 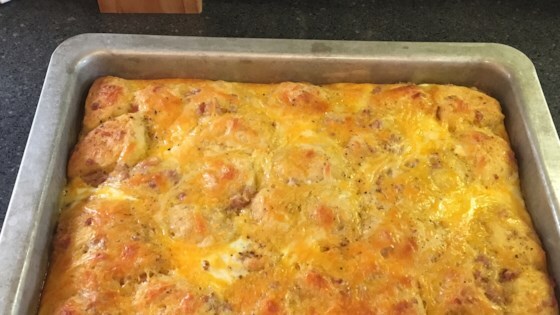 Perfect biscuits and gravy recipe for the whole family! For a little extra spice, add Tony Chachere's® Original Creole Seasoning to the egg mixture and/or the sausage while browning it. Pioneer® Brand Peppered Sausage Gravy Mix is a great option for gravy mix. Did that guy REALLY say that it was irresponsible to publish a recipe like this? LOL Wow, sometimes all you can do is shake your head and walk away.